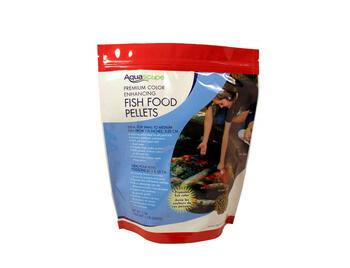 These Color Enhancing Fish Food Pellets 500g by Aquascape are ideal for every pond fish. With these pellets, you do not have to worry about a mess, because they are mess free. You can keep the water clean and clear. When you feed the fish, the pellets will not break apart and make the water cloudy. As an added feature, the pellets includes stabilized multivitamin. These pellets are packed full of high quality protein, which will help bring out the amazing colors on every one of your pond fish. Who is this Color Enhancing Fish Food Pellets for? This product is for any individual who currently has pond fish. These pellets are for all pond fish of different sizes. The pellets will help keep the fish healthy and will bring out all of the brilliant colors in a fish. As an additional benefit, these pellets will not cause the water to get cloudy  after each feeding, the water will remain clear.